Most people know that there are hundreds of different kinds of cheeses made in Italy, but many different kinds of honey are also produced in Italy, and the two make fine companions. 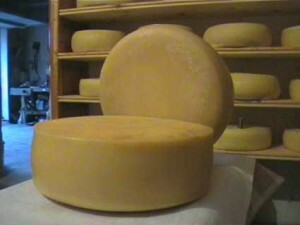 The mild floral taste of acacia honey is a good balance to the strong mossy taste of gorgonzola from Piedmont. Or try contrasting a sharp caprino (goat cheese) from the Dolomites, with an aromatic lavender honey. Pair a dark chestnut honey with a medium-aged pecorino cheese from Tuscany, and you’ll be rewarded with a contrast of woody sweetness and grassy milk. The ethereal miele di zagara – orange or lemon blossom honey, is made among the citrus groves of Sicily, and is excellent when paired with an aged Sicilian DOP cheese such as Maiorchino. Start with your favorite honey and experiment with different cheeses. My favorite honey from Italy is miele di carruba, made from carob blossoms. 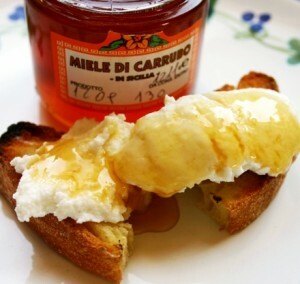 Made in Sicily in limited quantities in November and December, carob honey has an unusual nutty taste that is the perfect breakfast treat when paired with Modica’s fresh ricotta, yet carob honey has hold it’s own when paired with an aged cheese such as caciocavallo from Ragusa. Carob is one of the few trees that bears both blossoms and ripe fruit simultaneously. The tiny blossoms on my carob tree are just beginning to form in September, while the tree is full of ripe carob pods begging to be picked. Read about the carob harvest in Sicily.